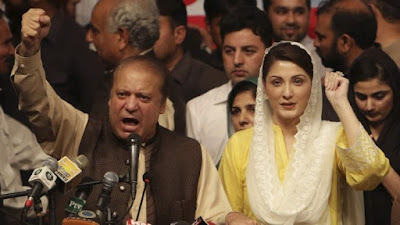 Former Pakistan PM, Nawaz Sharif, has bagged a 10-year-jail sentence for corruption, alongside his daughter, Maryam who got a 7 year jail sentence for same crime. The former Pakistan PM who also got a $10.5m fine, was handed the judgement before a packed courtroom in the capital Islamabad on Friday over the case which relates to the ownership of four apartments in the upmarket Park Lane neighbourhood of London, the capital of the United Kingdom. Sharif was dismissed as prime minister last July over corruption allegations, with the Supreme Court ordering the anti-corruption watchdog to launch proceedings against him and his family. Recall that in 2016, an International Consortium of Investigative Journalists (ICIJ) leak of 11.5m legal documents – dubbed the ‘Panama Papers’ – showed the Sharif family had secured a $13.8m loan in 2007, using the apartments as collateral. “Today, the anti-corruption court’s verdict … has made it clear that these assets, the Avenfield apartments, were acquired through corrupt means,” prosecutor Sardar Muzaffar Abbasi told reporters outside the courtroom. However Sharif who claimed he never got a fair trial, as he further alleged that he wasn’t a thief. “I will continue my struggle from jail. This is a part of the struggle” he said. His daughter Maryam who was also handed a jail sentence, was found to be involved in the ownership of a series of offshore companies, in whose name the properties were held. Her husband Muhammad Safdar was also sentenced to one year in prison, and will stand disqualified from running the upcoming polls. The court also ordered that the apartments owned by Sharifs be seized and handed over to the Pakistani government. Nawaz’s brother, Shehbaz Sharif, the president of the PML-N, said the party rejected the verdict, and will use all legal and constitutional means to challenge the verdict. “I believe that the timing of this verdict is an attempt to influence the outcome of the election,” Shehbaz, a former chief minister of northern Punjab state, said at a press conference in the eastern city of Lahore.